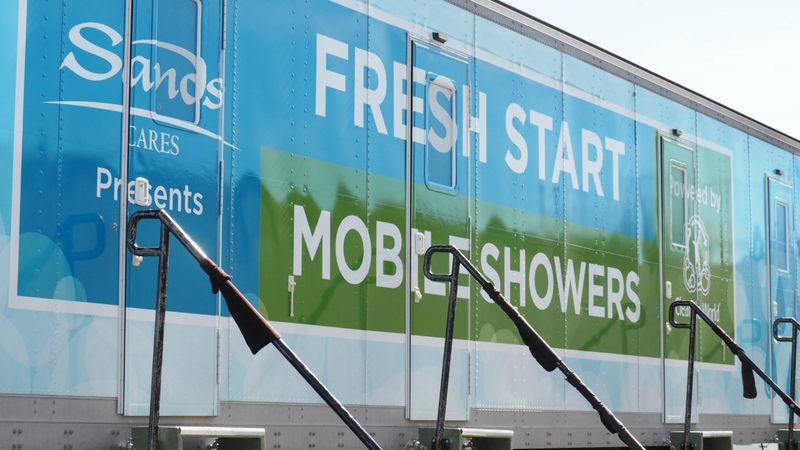 Las Vegas Sands and Clean the World teamed up in July 2017 to launch the “Sands Cares Fresh Start Mobile Showers,” as a response to the growing homelessness population in Southern Nevada, an initiative addressed by Sands Cares, the company’s global corporate giving program. 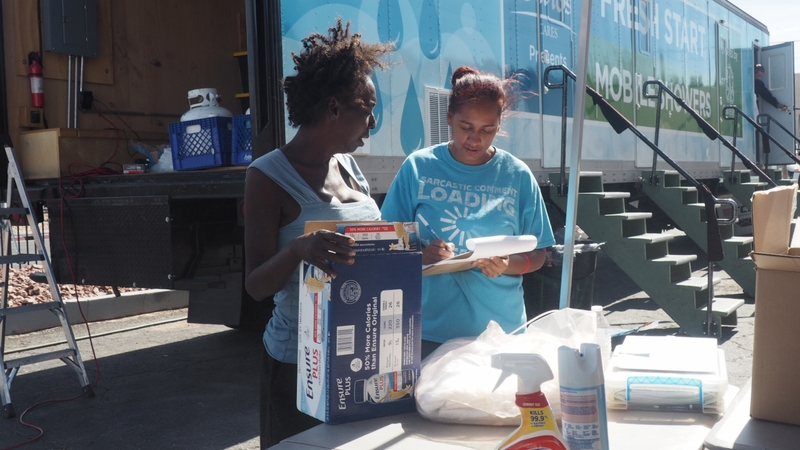 The mobile hygiene unit travels across the valley offering hygiene services to those experiencing homelessness. The unit, operated by Kevin Williams, mobile hygiene manager at Clean the World, is in service five days a week containing four private bathrooms all equipped with a shower, toilet, sink, hygiene supplies, and other resources. In just one year, Williams built a small team to help provide relief and assistance to those in need through the Fresh Start Mobile Showers, but ended up gaining a larger family. Though his job is no easy feat. The mobile unit has the capacity to provide 60 showers a day, with a waiting list that fills up quickly within an hour. With the help of his team including Ashley Carr and Jameel Milligan, Williams is able to manage the unit to carry on Clean the World’s hygiene mission and provide access to a much-needed shower. Carr volunteered to help with Fresh Start Mobile Showers within the first few months of its launch. While still maintaining a full-time job, Carr is driven by her passion to help others and has said she is in it for the long haul and will continue to assist Williams in managing the mobile unit. “For me, the impact we’re making is amazing. We make them feel human again. They deserve somebody, and everybody is somebody,” she said. Galbraith believes in the power of numbers and likes being part of a team. When he can, Galbraith will volunteer and help out at the showers. He’s not able to follow the shower unit every day, but will walk to it if it’s close enough. Galbraith appreciates the privacy of the showers, a resounding trait that many users agree on. Terry, who has also used the showers since last summer, values the ability to take a private shower. As a transgender, Terry explained that are few places to stay and shower that is safe, but a shower is necessary. 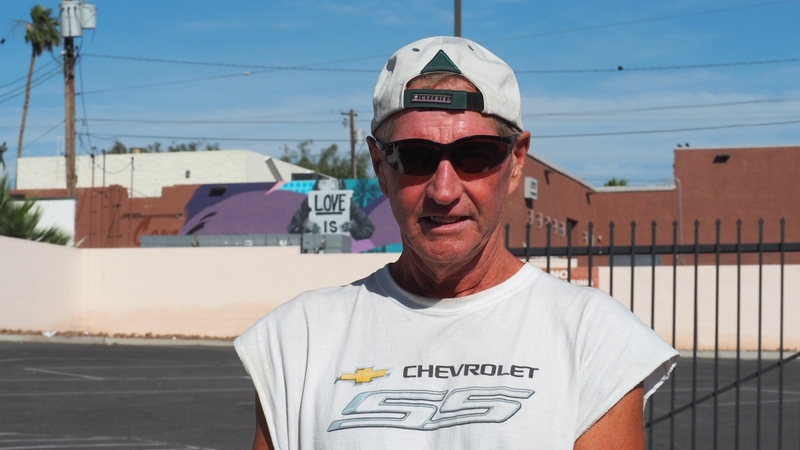 “We’re sleeping on the curb or sidewalk with a little blanket. The ants crawl on us and bite us. So it’s good to have a shower,” she said. Terry waits for the showers to come and tries to get on the list as soon as its open, or she knows she’ll miss a shower. She finds relief in the showers from the city’s heat, even if it is just for a few hours before the afternoon heat. “I hope they turn some of these buildings around here into something for us, so we can have our own building,” she said. To learn more about Las Vegas Sands and Sands Cares, visit the Sands Confidential blog.